ClarityBlast is an all-natural proprietary treatment blended with bacteria and enzymes. This combination works together to remove attached organics, break down sludge and organic debris and prevent further buildup. 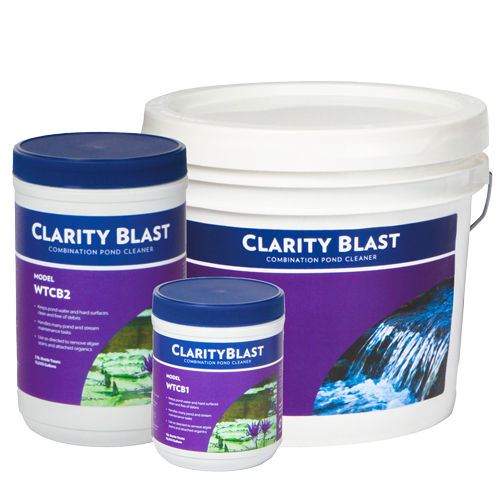 ClarityBlast cleans waterfalls, streams, ponds, plant pots and filters. Application Rate: Apply 1 scoop (1 oz) per 1,000 gallons once a week. If problems persist apply ClarityBlast twice a week at the prescribed rate until desired results are achieved. Pond may become cloudy after application, this is normal. Cloudiness should clear within 24-48 hours after application. For Best Results: Remove excess debris by hand or brush before initial application. With pump turned off, apply ClarityBlast directly to area to be cleaned. Wait 10-15 minutes before turning the pump back on. Use supplemental aeration to enhance biological activity. Optimal Water Condition: pH: 6.5-8.5, Temperature: 50F or above.